An exoplanet, or extrasolar planet, is an object orbiting another star than our Sun. If such definition seems deceptively simple, the current state of the research is driven by the search of a more refined and unanimous definition as the astronomical community hardly agrees. “An exoplanet is an object with a mass similar to or smaller than Jupiter that revolves around another star”, states cautiously Étienne Artigau, researcher at iREx. In the community, they are two main schools of thought that divided exoplanetologists, thus his prudence. On the one hand, astronomers suggest that a planet is an object with a mass lesser than 13 Jupiter masses. Why this limit? Below this mass, physics predicts that no astronomical body can sustain nuclear reactions fusing deuterium to helium in its core. Such limit is, however, vague and some exoplanets are believed to have masses above 25 times that of Jupiter. On the other hand, it has been suggested that a planet is an object forming within a disk and is gravitationally bound to a star, i.e., it revolves in a closed-orbit around its parent star. This definition excludes from the start a new category of planet-like bodies called free floaters, or rogue planets, that wander freely in space. Have the latter been born in an extrasolar planetary system and later been ejected into space or are they planets that formed by themselves following a gravitational collapse? The question remains open. If the extrasolar planet definition is far from unanimous, the astronomical community nevertheless agrees on its current inability to classify these objets. “Exoplanets are most certainly the most diverse object category we know,” claims Étienne Artigau. The array of physical properties of planets such as their mass, radius, density, surface temperature, and atmospheric chemical makeup exhibits seemingly endless possibilities, such as “hot Jupiters”, orbiting in very close proximity to their stars, or the “super-Earths”, rocky planets with masses slightly greater than that of our planet. In 2006, the International Astronomical Union revised the planet classification and definitions. They created a new category of planetary body known as dwarf planets among which is now found Pluto, reflecting our recent view of our Solar System. In the light of the near 2,000 exoplanets that have been discovered today, our perspective is once again challenged, this time with the vast spectrum of properties of these objects and their formation processes. 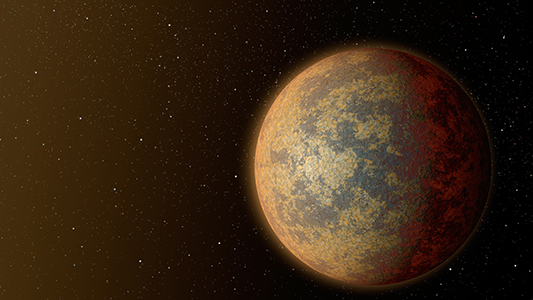 Image : Artist depiction of HD219134 b, a “super-Earth” with a radius 1.6 time greater than Earth’s. Credit : NASA/JPL/Caltech.